I am sure many of you have seen my tattoo…but do you know what all it symbolizes to me? Likely not…because I have been selective who I have told what, and not really shared the entire message with any one person. There is so much depth to this seemingly simple little doodle, that I didn’t even understand the impact it would have on me fully until after I had it and spent some time looking at it, reminding myself to be kind to myself, pause, and keep going. The story behind my first tattoo…it started with an online art workshop by Kelly Rae Roberts called “Hello Soul, Hello Mixed Media Mantras”. Kelly Rae encouraged us to write our intentions or affirmations on our hands or arms while we created. So I spent a lot of time writing on both hands and/or arms, until I started getting deep and embarrassed for other people to see what I wanted to write to myself. So I started playing with symbols and a sharpie. 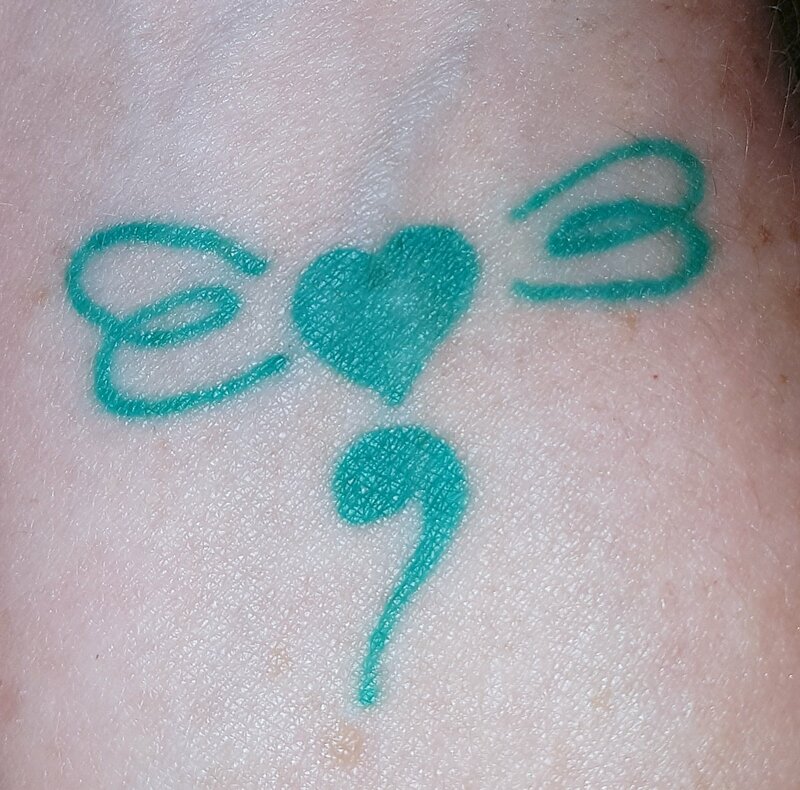 At that same time, I was introduced to the semicolon project, and being in the state of mind I was at the time, it really touched close to my heart. Have you heard of Project Semicolon? It began in 2013 as a social media movement, encouraging people to draw a semicolon on themselves and post a picture. The semicolon represents mental health struggles and the importance of suicide prevention. “A semicolon is used when an author could’ve chosen to end their sentence, but chose not to. The author is you, and the sentence is your life.” This grew into a non-profit organization…a “movement dedicated to presenting hope and love to those who are struggling with depression, suicide, addiction, and self-injury.” Multiple projects were inspired by this movement, including the Semicolon Tattoo Project. “(The tattoo) is a conversation starter…People ask what it is and we get to tell them the purpose.” There is a huge stigma associated with mental health. The more we talk about it, the less power that stigma has…for shame cannot survive when spoken. It’s kind of like saying Rumpelstiltskin, he can’t survive hearing his name. I had been struggling with a severe depression, following a head injury, and was learning a number of different strategies and tools to help me get through the tough moments and eventually each day. I was constantly reminding myself to pause, and breathe, and be mindful of my feelings and my current surroundings. So this symbol and the thought of a visual reminder to “pause, and then keep going” really resonated with me. I drew a semicolon on my arm with sharpie for a few days…but it wasn’t enough. I was still reminding myself in those moments of pausing to be kind to myself. To practice self-compassion, acceptance, and forgiveness. And just like that, the dot became a heart. And I loved it and I wore it around for a week or two like that. And no one knew what it meant except for me, and I was practicing my affirmations without embarrassment. But it still didn’t quite seem like it told me the full message I needed to hear. In my mixed media mantras, my intentions were becoming “trust your wings” and “follow your heart”, and so, just fiddling around, I added wings to my doodle. BOOM! There it is. And if anyone asked that I didn’t want to explain it to…I could tell them it is a stylized dragonfly…I love dragonflies so this was suiting as well. So I got the tattoo! I played with colour a little bit, and settled on this amazing teal. And then, I got thinking about dragonflies…and did a little research into their symbolism and well, that just added to my excitement. First, dragonflies, like butterflies, are a symbol of transformation. “The dragonfly, in almost every part of the world symbolizes change and change in the perspective of self realization; and the kind of change that has its source in mental and emotional maturity and the understanding of the deeper meaning of life.” Take for instance that the dragonfly can move in any direction, or hover. It is highly adaptable and able to change direction smoothly in an instant, living in each moment. The dragonfly can also see in 360 degrees, symbolizing the ability to see beyond the limitations of the human self. It also spends time living in water, on land and in the air, demonstrating comfort with change and evolution, and again, adaptability. How perfect is this? What started as a little doodle has become such a significant symbol in my life. So significant, that besides using it every day as a reminder to pause and be kind to myself, it has become a part of my logo…the symbol of my art journey. Again…how amazingly cool is that, the relevance of all that it stands for. Do you have a symbol that means something special to you? How did you come up with your logo if you have one? Wow! That’s all that is in my dad right now! Wow! You are so brave and true to yourself. I love the part about talking about depression and mental illness..and taking away the stigma, the shame. I have a stylized mermaid on my arm, it’s big! I have told people that I just like mermaids when in truth it means so much more. To me it is the choice to believe in the impossible. To believe in things we can’t see. I got it because I believe in me. I love it, Linda! What a great reminder to always believe in yourself. I love the personal meanings behind tattoos. There is always a story. Thank you so much for sharing!